Here's another project from Schemata Architecture Office, this time a house built at 63.02° to the road. Photographs are by Takumi Oota. See our earlier story on Sayama Flats by Schemata Architecture Office. 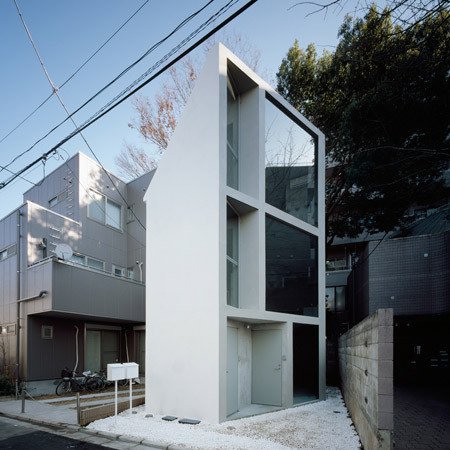 63.02°is built on a built up area in Tokyo. This small building is used as SOHO and an apartment for rent. This building is cut on the axis line inclined to a front road by 63.02°. The window in this building concentrates there. You can see the intersection by seeing the outside through the windows. In front a splendid cherry blossoms tree stands. It is only fine sight in this building that is acquired in the center.